In 1845, Kamehameha III established a permanent seat of government in Honolulu (moving from the prior capital at Lāhainā.) He acquired for his capitol the former Hanailoia (a home built by Governor Mataio Kekūanāoʻa for his daughter (Princess Victoria Kamāmalu)) and named it Hale Ali‘i, it was the palace used by Kings Kamehameha III, IV, V and Lunalilo. In Ho‘iho‘ikea were transacted some of the most important affairs connected with the history of Hawai‘i and within its walls were held many an important council to decide the interests of this nation, their advancement and their prosperity. In 1834, Kīna‘u, Kauikeaouli’s half-sister, had given birth to a son, Alexander Liholiho. Kauikeaouli look Alexander as his hānai child and raised his young nephew as his own son, preparing him to be the next monarch of Hawai‘i. Kauikeaouli died at Ho‘iho‘ikea. The palace building was named Hale Ali‘i meaning (House of the Chiefs.) Kamehameha V changed its name to ʻIolani Palace in honor of his late brother and predecessor. (ʻIo is the Hawaiian hawk, a bird that flies higher than all the rest, and lani denotes heavenly, royal or exalted.) Although the old palace was demolished in 1874, the name ʻIolani Palace was retained for the building that stands today. This image is from Burgess’ No. 2 – View of Honolulu From the Catholic church (c. 1854) – on the right side you can see a church steeple (Kawaiahaʻo,) in front of it is Hale Ali‘i, with the flag to its right (it was renamed ʻIolani Palace in 1863.) In and around there are the respective houses of the aliʻi, including Ho‘iho‘ikea. The Consular Corps is in charge of looking after their own foreign nationals in the host country; a Consul is distinguished from an Ambassador, the latter being a representative from one head of state to another. A Consul is used for the official representatives of the government of one state in the territory of another, normally acting to assist and protect the citizens of the Consul’s own country, and to facilitate trade and friendship between the peoples of the two countries. Former Chief Justice of the Michigan Supreme Court, Abner Pratt, resigned from the bench in 1857, when President James Buchanan appointed him the first US Consul to the Sandwich Islands (Hawaiʻi,) with headquarters in Honolulu, a post he held until 1862. He was a man of peculiar traits of character. His views, impulses, likes and dislikes were of the most decided kind and assumed the control of his conduct. He gave his whole energy to whatever principle or policy he espoused. This made him a bitter opponent or an unflinching friend. Click HERE to a story on Hale Aliʻi. Pratt, who often wore tropical clothing more suitable for Hawaiʻi than winter in Michigan, did not get to enjoy the house for long; he died of pneumonia on March 27, 1863, after he had returned home in inclement weather from a trip to the state capital in Lansing. At the time of his death, Pratt had been serving in the state legislature. The Honolulu House is the headquarters of the Marshall Historical Society and is open to the public May – October from noon to 5 pm, 7 days a week. 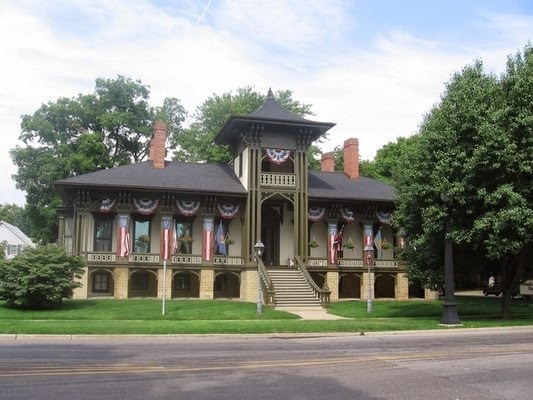 The image shows Honolulu House in Marshall Michigan.